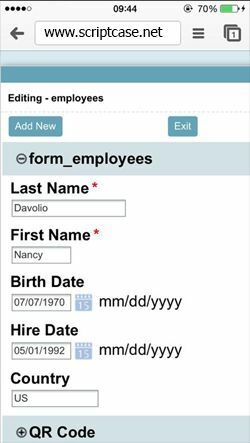 This application type updates information in the database using web forms. The update may be direct (INSERT, UPDATE and DELETE) or using stored procedures. A form can be displayed in several formats. It can edit a single record or multiple records in a single page, also it is reworked to display when accessed by a mobile device. With this, the form created on Scriptcase, recognizes the device that is accessing it (Tablet, Smartphone or Desktop...) and adapts to the layout that best suits the resolution required, applying so the Responsive concept. See the different formats in the image below. Hidden Fields Hide fields in forms display while update field. Read-Only Fields Fields are displayed but update are not allowed. Required Fields Fields with obligatory entry. Values must be entered. primary keys are automatically defined as required Fields. Unique Key Define unique keys with update validation. Procedures Use stored procedures for data manipulation. Master / Detail Update various related tables in a single page. Update link table Handles N:N relations in a single form. Dependencies Define form table dependencies. Criticisms are automatically generated according to the definition. 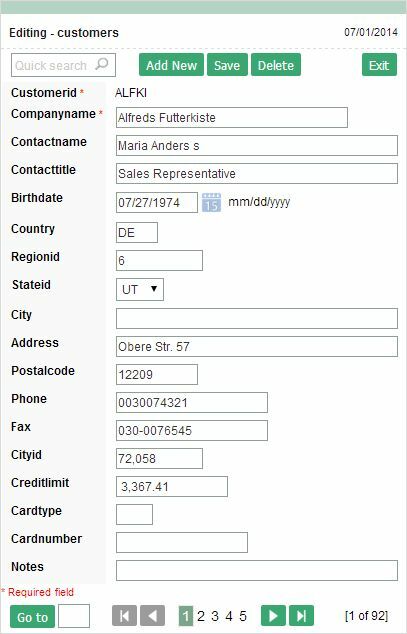 Fields Format According to the field type required validation are generated as well as different formats area available. Events Programming Allow the developer to add business rules in PHP code. The form events are triggered during the processing in the server or by the browser (AJAX). Links creation Link a form with other applications.